Sooriyan FM broadcast various kind of latest hip hop, classic, dance, electronic etc. 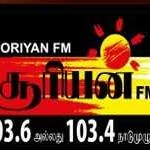 music.Sooriyan FM live broadcasting from Sri Lanka. 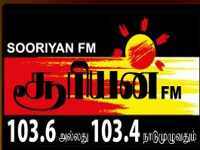 Sooriyan FM is a one of the most famous online radio station on Sri Lanka. Sooriyan FM is, as at now, a multi-award winning Radio Channel in Sri Lanka. Asia Broadcasting Corporation Private Limited, a part of Rayynor Silva Holdings the owning company of Hiru FM/Gold FM/Sooriyan FM/Sun FM/Shaa FM, set up 12 years ago, revolutionized the Media industry setting up Sri Lanka’s First Ever Private Tamil Channel -Sooriyan FM, Sri Lanka’s First Ever English Oldies Channel -Gold FM, Sri Lanka’s First Sinhala Youth Channel Shaa FM along with Sri Lanka’s number one Sinhala radio channel Hiru FM and Sri Lanka’s youth English trend setter Sun FM.